This is a very good looking, sober and clean poster. The problem is that this is a Will Ferell sports comedy. And those have been known to use successfully some much less sober posters. Perhaps the humor in this movie is a little different than that of recent Ferell films. More subtle, possibly. In that case this poster might offer an accurate idea of what the movie is like. But I think people have come to expect a certain type of film from Ferell, and a poster that makes Semi-Pro seem much different from that kind of film might keep some of his fans away. 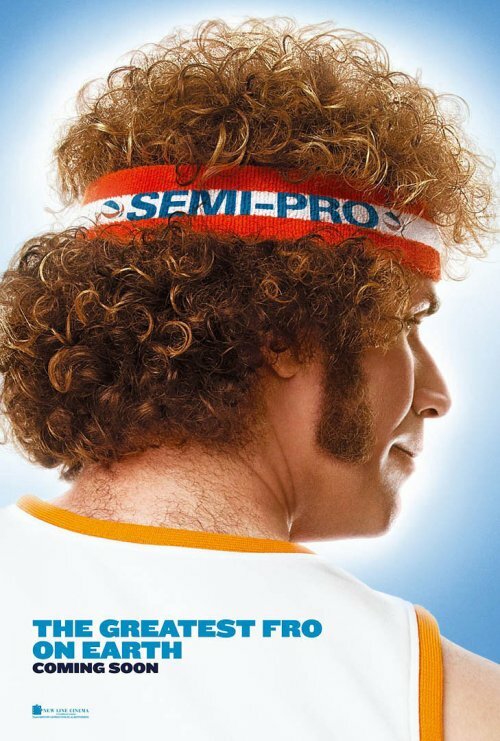 The Semi-Pro poster is a vast improvement over the Blades of Glory one – it takes a page from the Knocked Up/40YOV posters, using a simple, stark image of the star, while appearing to embrace their goofiness/dorkiness/ugliness. You know, I don’t disagree Fletch. It’s just that I don’t think this movie will be anything like Virgin or Knocked Up, and I’m not sure they are doing themselves any favors by going for a different demographic than the one that generally eat Ferrell’s films up. But I could be wrong. I’m not so sure the demo is all that different. Sure, the Apatow films are a bit more cerebral, but in a way, they’re all big, dumb comedies (which I like, don’t get me wrong). It’s not as if this were a drama.